I absolutely loved this film when I was a kid. I am ld enough to say I saw it in the theatres without my parents. For years I have occasionally thought of this movie, fondly of corse. When I saw that it was available here on Netflix I was hesitant – I didn’t want this to be one of those situations where I watch a movie that I loved as a kid and then end up walking away hating it for being a piece of garbage, ruining a great memory, After watching this I am very happy to say that isn’t the case with this film: it’s still a fun movie. It’s the story of three good friends that build a space ship based on some schematics that one of them, Ben Crandall (played by Ethan Hawke) dreams up his brainy friend Wolfgang Muller (played by the late River Phoenix) builds into a circuit board and contrlloed by his might Aplle IIC, combines it with part of an old Tilt-a-Whirl. Along the way they pick up a new friend, tough guy with a big heart Steve Jackson (played by Jason Presson) and it’s off they go. After a few bumps during test flights (including just about getting caught by a chopper pilot), they make the big flight and fingd themselves brought aboard a larger spaceship where they finally get to meet the aliens that set the whole thing up… with a twist. This is a fun movie and admittidedly is a kid (teen) movie – that said, it’s a fun adventure that has aged well. This entry was posted on September 18, 2012 by catfishman. 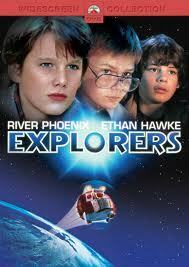 It was filed under Uncategorized and was tagged with 1985, adventure, alens, Ethan Hawke, explorers, fun, laughs, movies, River Phoenix, sci-fi, science fiction, silly, teens.